I haven’t posted in a while and I should confess that this post was really meant to go up over a month ago when strawberries were still in their prime. You may be wondering how this recipe is now relevant. The beauty of a simple salad such as this is that the fruit can easily be substituted for a seasonal selection such as peaches or plums. Balsamic vinegar reductions or glazes work well with many seasonal stone fruits as well as figs and strawberries, of course. The richness of the vinegar reduction or glaze pairs perfectly with the sweetness of the fruit while giving it just a touch of acidity. When mixed with creamy goat cheese, spinach, and walnuts, you have yourself a simple tasty summer salad. This recipe has little relation to my grandmother’s recipes or classic recipes, in general. It is just so simple and tasty that I thought I would share it. I originally made this on a warm summer day in June when I was craving a light lunch and didn’t want to cook or turn on the oven. I had just bought a pint of juicy fresh strawberries from the farmers market and goat cheese is one of my favorite cheeses to include in a salad that contains fruit. Walnuts add a crunch and much needed substance. 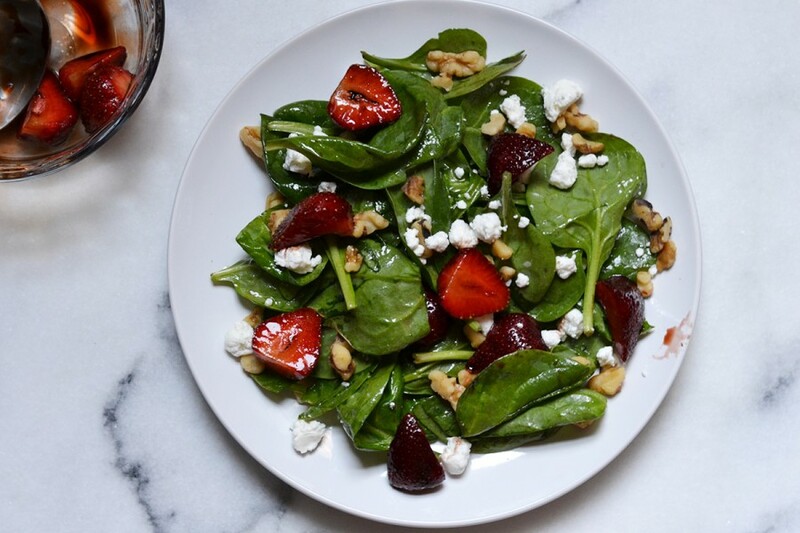 I could have simply used plain strawberries without the balsamic glaze, but I normally find fresh fruit almost too sweet in salads that contain leafy greens such as spinach. I happened to have a balsamic glaze in my pantry so I gave the strawberries a quick toss to coat and added them to the salad. Who really needs the salad part when you have fresh strawberries coated in sweet balsamic syrup? I could easily eat them by the bowlful or over ice cream. But in the interest of trying to be healthy, I created this light fresh salad. I’ve added instructions below to make a balsamic reduction if you don’t have or want to buy a balsamic glaze. Either one will give your fruit that extra luxurious flavor. It’s the perfect way to take that boring summer salad to the next level. Hull and slice strawberries. Place in a small bowl. Drizzle balsamic glaze over top and toss to combine. Note: if making a balsamic reduction instead of using a store bought glaze, pour 1 cup balsamic vinegar into a small saucepan and bring to a simmer over low heat. Simmer until balsamic vinegar is thick, about 10-15 minutes. Cool. Combine spinach, goat cheese, and walnuts in a large mixing bowl. In a separate bowl, add red wine vinegar. Whisk in olive oil a little at a time to emulsify. Whisk in mustard, salt, and pepper. Drizzle dressing over salad and toss to combine. Serve salad on small plates and spoon balsamic glazed strawberries on top.